While serving as the U.S. graphic display industry’s leading PVC board for more than 20 years, Sintra is a newer product offering from distributor SEL Consulting in Medellin. Sintra is comprised of a moderately expanded closed cell polyvinyl chloride in a homogeneous sheet with a low-gloss matte finish. Durable Sintra is easy to fabricate with wood or foam board techniques. It cuts cleanly, creating smooth edges; and, it can be direct printed and accept vinyl graphics. Sintra fabricates easily without special tools and can be heat formed and laminated to other materials. 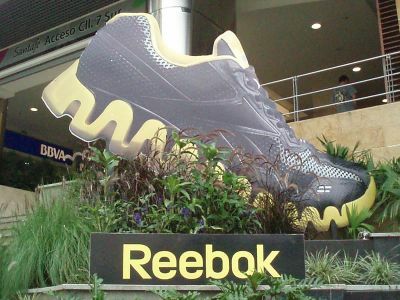 Sintra was chosen for the Reebok athletic shoe displays following a review of several substrates, according to Monica Ruiz, marketing manager, SEL Consulting. Printed vinyl images were applied to six sheets of Sintra for each display. 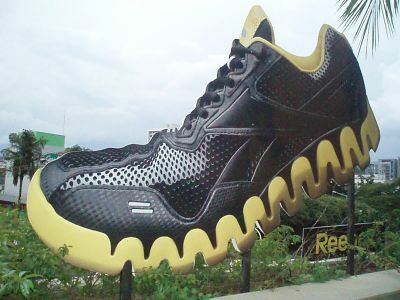 Images then were die-cut to create the shoe shape. Finished displays were installed with a steel structural frame.